17th-century brown blind-stamped calf over original (?) wood boards, 17th-century silver catches and clasps, 7-tasseled green silk book marker with silver clasp. 170 leaves (1 column, 22 lines), bound : vellum, ill. ; 215 x 155 mm. Purchased by Mr. E. Clark Stillman (1907-1995) in NY, 20th century; E. Clark Stillman Collection. 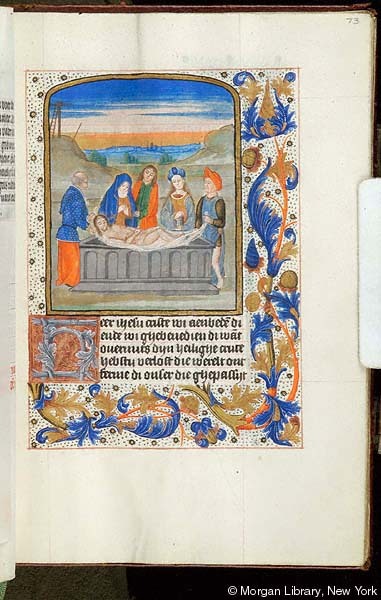 Ms. book of hours, use of the Augustinian Canons of the Windesheim Chapter (Hours of the Virgin, Long Hours of the Holy Cross, Office of the Dead), and calendar for Utrech; written and illuminated in the Netherlands, possibly Utrecht, ca. 1490. Textiles: 17th-century 7-tasseled green silk book marker with silver clasp. Decoration: 15 full-page (inserted) miniatures, 9 half-page miniatures, 7 smaller miniatures, 15 historiated initials, 9 marginal illustrations; Dutch Gothic style. Artist: Masters of Catharina van Wassenaer (Dark Eyes Group).